(PRLEAP.COM) RCH Group's new manufacturing plant in Vietnam will support the global expansion of the Group's POS business. Equipped with advanced technologies, the factory will produce high-tech electronics for RCH's point of sale (POS) products. Operations kick-started in January 2018 providing increased production capacity to support the company's growing customer base. RCH is renowned for its refined Italian design and innovative high-tech products. To ensure the continuity of high standards and the "made in Italy" stamp that are characteristic of all RCH products, Quality Control will be undertaken by engineers relocated from Italy. All aspects of the factory's operations will be managed by an Italian native, Paolo Andretta. Core functions such as research and development, product design, distribution and logistics remain located at the Group's headquarters in Italy. 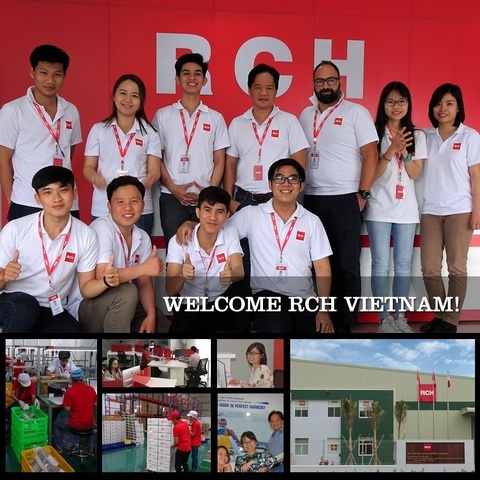 "We have been working in this region for a very long time and appreciate how Vietnam has advanced in terms of technology, especially in all hardware and software aspects which define RCH's core business," said Paolo Andretta, General Manager, RCH Vietnam Limited Liability Company. "We were also attracted by the high skills of the local workforce and the investment that the Long An region has made in the development of its infrastructure." RCH has a longstanding presence in Asia-Pacific with offices in Hong Kong and Guangzhou, China. Hong Kong will continue to be the regional headquarters for all RCH's Asia-Pacific sales and operations. The RCH Group of companies offers advanced point of sale systems for the retail, food and beverage, entertainment, hospitality, franchising markets and the public sector. The Group's innovative products include cash registers, self-service ticketing kiosk, automatic cash desks and cloud-based back office services. Workshop F.01B-2, Lot No. F.01B, Long Hau-Hiep Phuoc street, Long Hau Industrial Park, Long Hau Ward, Can Giuoc District, Long An Province. Nhà xưởng F.01B-2, Lô F.01B, đường Long Hậu – Hiệp Phước, KCN Long Hậu, xã Long Hậu, huyện Cần Giuộc, tỉnh Long An.